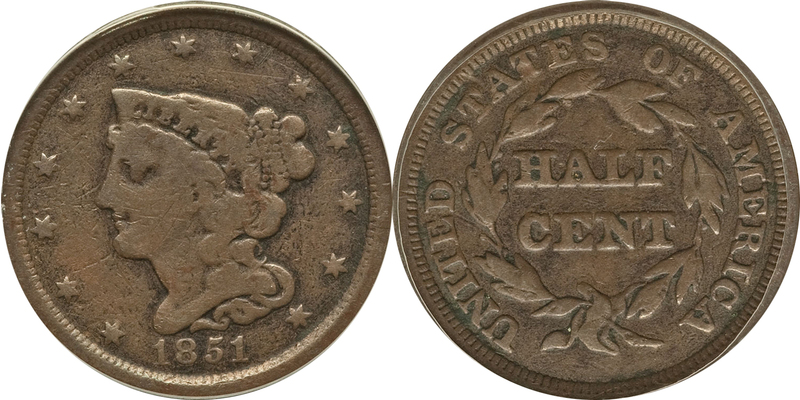 1857 is the lowest mintage and the value starts at $50 and this is followed by the 1849 and 1850 and they are worth around $45 in the lowest grade. The proofs and proof restrikes from 1849-1850 are extremely rare and their values begin in the thousands for all dates, and in the lowest grades. In G4 you can find most Braided Hair Half Cents for around $40-$50 raw and even less in grades AG3 and less. You can also find them at a larger discount if they’re cleaned, corroded or damaged in some way. In MS (Mint State) grades the coins are worth anywhere from $150 to $300 and this will depend on the coin’s eye appeal and if its RD (Red) or BN (Brown). You also have three conditional factors that determine the Braided Hair Half Cent value and they are: Red (RD), RB (Red-Brown), BN (Brown). A RD coin is going to have at least 90% original luster as struck by the mint and is the most valuable condition. The luster conditions only apply to mint state coins so any circulated coin will be designated BN. 1849 Large Date is worth a few more dollars than a normal die. Braided Hair Half Cent Value. Worth of a US Braided Hair Half Cent Coin.